Who was the Aztec sun god? Actually, it's not such a simple question. Why? Because in the Aztec religion, there wasn't only one sun, and there were many sun-gods over many ages. It's kind of like looking at a list of Mexican presidents - only a little more complicated. To make it even more tricky, the empire was actually a mosaic of many cultures, and so it was a combination of more than one (related) religions! In Aztec religion there were 5 ages, or "5 suns". Each of these ages had a different Aztec sun god, and each age ended in disaster. The represents only one storyline in the Aztec empire. Tezcatlipoca (smoking mirror) was the first god to be a sun. The god of the night, Tezcatlipoca was an enemy of Quetzalcoatl. Quetzalcoatl knocked Tezcatlipoca from the sky, and in revenge Tezcatlipoca took the form of a jaguar and destroyed the world. The natural replacement was Quetzalcoatl (feathered serpent), who became the next sun. But the rivalry continued, and the paw of the jaguar knocked him from the sky. So the reign of the second sun god came to an end. A great wind arose and there was great destruction on the earth. The gods next chose Tlaloc, a god of rain, to be the sun. But Quetzalcoatl wasn't happy, and made the fire rain down, causing destruction on the earth and the end of the age. Next came the Aztec sun goddess - Tlaloc's sister, Chalchiuhtlicue (lady of the jade skirts), was chosen by Quetzacoatl to next rule the sky. Chalchiuhtlicue was the goddess of water - lakes and streams. But once again the fighting of the gods caused the destruction of the world, which was again destroyed by floods. No other god wanted the job of being the sun. A council was formed, and the gods decided that the last sun would have to offer his life, so that the world and its people would survive. Two gods were chosen: Tecciztecatl was the first, a wealthy and powerful god. The second was Nanauatl (or Nanauatzin), the humble god. His name means full of sores. A great fire was kindled, and the one who would be the sun god would have to leap into the fire. Tecciztecatl, proud and desiring immortality, tried to jump in, but was afraid because of the intense heat of the flames. After four attempts, he still could not bring himself to jump. Finally, Nanauatl was asked to jump - and he did. His pride wounded, Tecciztecatl leapt in after him! So now we've had six sun gods, and two suns at the same time! The gods wouldn't stand for this, so they threw a rabbit into the face of Tecciztecatl to dim his brightness. And so he became the moon, doomed to chase the sun forever, but never to shine as bright. And so Nanauatl was to be the Aztec sun god. He was given the name Tonatuih. 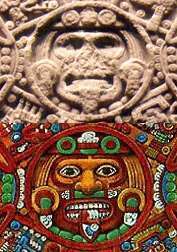 It is Tonatuih's face that many believe to be on the Aztec calendar stone. So Tonatuih was the sun god, right? You could probably say that, but who was Tonatuih? He was Nanauatzin, the humble god who flung himself into the fire. But the Aztecs had another sun god - Huitzilopochtli. Huitzilopochtli (hummingbird of the south) was a god of war. As the Aztec empire grew and conquered, it became more and more a culture of warriors. Huitzilopochtli was the Aztec god, the leader that allowed them to conquer. As the power of the empire grew, it made sense to believe that Huitzilopochtli was a very powerful god. The peoples of Mexico believed that the sun could not move on its own. As a matter of fact, when it first came into the sky, it couldn't move at all. The gods themselves had to be sacrificed. And now humans had to repay the debt, and keep the sun moving, with their own sacrifices. 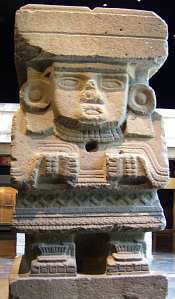 The image on the Cuauhxicalli Eagle Bowl, believed to be Tonatuih, the Aztec sun god. Above, the actual image, below an artist's colour conception. Warriors, gods and human alike, fought in the sky to keep the sun moving. The great warrior god was the one who fought for the sun, and so he himself is often considered the Aztec sun god. Depending on which version of the story you read, the god Ehecatl (the god of wind) was also one of the suns. He is also considered simply an aspect of Quetzalcoatl. Ehecatl sacrificed all the gods to get the sun moving. And so the Aztec gods are dead (have no physical form), but Ehecatl (who was not sacrificed) can still be felt (in the wind). So common Aztec sun gods of the past would be Tezcatlipoca, Quetzalcoatl, Tlaloc, Chalchiuhtlicue and Ehecatl. The last sun was Nanauatl (Nanauatzin) or Tonatuih, and the warrior of the sun was Huitzilopochtli. See some pictures of the Aztec sun god here. More about Huitzilopochtli the sun god here. There's information on many of the Aztec gods in Wikipedia.